Suffering is a reality of life, experienced by all conscious beings. Suffering is caused by failing to see the true nature of the self (impermanence), wanting things to be other than they are, and the desire to avoid suffering. It is possible to end this suffering and be free from it. This can be achieved through mindfulness, living one's life with love, care, and attention. The eightfold path laid out by the historic Buddha serves as a guideline to assist with living one's life in this manner. Buddhism is based on love, as well as three ways of practicing love: metta or loving kindness; compassion, or the desire to see all conscious beings free of suffering; and Bodhichitta, known as the "Mind of Enlightenment," which is a sense of total identification with all other conscious beings and the desire to see them happy and free of suffering. Buddhism teaches the impermanence of everything. There is no permanent self, nothing which might be called a "soul." Rather, the nature of the "self" is a flowing, ever-changing process. Clinging to one's personal fears and desires, believing in an individual "self," keeps one trapped in an endless cycle of suffering. In order to escape this cycle and enter Nirvana - a permanent end to suffering - one must realize that what we call a "self" is part of a universal process of change and renewal. Buddhists are directed to "take refuge in the Three Jewels," which are the Buddha, or the Enlightened State of Consciousness; the Dharma, the teachings and practices of the Buddhist path; and the Sangha, or Buddhist community. Buddhism also teaches rebirth. However, the idea of rebirth through reincarnation is not a universally accepted belief among all Buddhists. One belief states that, until one has truly achieved enlightenment, they will continue to be reborn into a new life after each death. Each life will be affected by that person's conscious actions and moral and ethical decisions in past lives. This is known as karma. With karma, like begets like. Kindness leads to kindness, anger or hatred leads to anger and hatred, etc. Attaining enlightenment will free a person from this continuous cycle of death and rebirth. However, some Buddhists do not interpret rebirth as literal reincarnation. Instead, they understand rebirth to mean the possibility to learn and grow in one lifetime in order to reach enlightenment. There are three main branches of Buddhism: Theravada, Mahayana, and Vajrayana. The Buddhist centers listed here do not represent all of these branches; rather, this is a random sampling meant to give an idea of the widespread practice of Buddhism in general in Pennsylvania. Besides those described here, there are several other branches of Buddhism, including forms not practiced in the West or that appeal more to those in the East, such as Pure Land Buddhism. Theravada Buddhism is the oldest form of Buddhism. It teaches that enlightenment cannot come simply through faith, but through analysis, investigation, and experience, as well as considering the advice of the wise. Theravada Buddhism stresses that each individual person is responsible for their actions, the consequences, and their own enlightenment. It also emphasizes the importance of moral conduct and the ideals of renunciation and metta. The ultimate goal of Theravada Buddhism is to become an arhat or arahant, a person who has reached total Awakening. Mahayana Buddhism bases its beliefs on the emphasis of Bodhichitta, the ideal of universal love and freedom from suffering for all conscious beings. Mahayana Buddhists also believe in the existence of Bodhisattvas, which are beings who possess traits or characteristics Buddhists aspire to, such as compassion or wisdom. While the nature of Bodhisattvas can seem confusing to non-Buddhists, they are commonly understood as the idea of any person devoting their life to healing and helping others. Bodhisattvas devote themselves to helping others achieve enlightenment and freeing them from samsara - the state of ignorance of the true nature of existence. One goal of Mahayana Buddhism is attaining bodhisattvahood, since it follows the teaching of universal freedom by helping others be free from suffering. Mahayana Buddhists also strive to accumulate merit and wisdom, achieved through living with loving kindness towards others and gaining insight into the true nature of reality. Mahayana Buddhism teaches that each person has the potential to become a Buddha, or to experience freedom from suffering by seeing things as they really are. Vajrayana Buddhism, also occasionally called Tantric Buddhism, is a branch-off of Mahayana ideals which emphasizes ritual and visualization in meditation. This includes advanced meditation practices like deity visualization, which is a difficult but rapid path to enlightenment. However, Buddhist deities differ from gods understood in the same sense as the Judeo-Christian/Muslim God. Rather, they are symbolic representations of aspects of enlightened consciousness. Vajrayana Buddhism must be taught by a trained teacher and cannot simply be learned from a book or fellow practitioner. Many techniques of Vajrayana Buddhism are kept secret, since it is believed that the teachings have no validity outside the teacher/student relationship. This relationship to one's Guru, or teacher, is an indispensable part of the Vajrayana path to enlightenment. The ultimate goal of Vajrayana Buddhism is to become a Buddha. Zen Buddhism is the Japanese form of Chan, a branch of Mahayana Buddhism that originated in China. Like many other Buddhist paths, it emphasizes universal enlightenment for all conscious beings. At its core is the practice of zazen, an intense sitting meditation that is meant to harmonize the mind and bring about insight into the true nature of reality. Daily meditation is key to the practice of Zen Buddhism. A new branch of Buddhism that allows practitioners to identify with certain teachings of Buddhism, but not necessarily be connected to one of the three major branches. This school uses engagement as a main practice through social problems and focusing on helping those in great suffering. The Blue Mountain Lotus Society has communities all over the country, in Las Vegas, Miami, and New York City, as well as smaller areas, such as Carlisle and Lancaster. However, it began in Harrisburg in 1998. The main building, the House of Meditation, at their current location, was built in 1920, and was purchased for its present use in 2004, where they hold meditation and mindfulness study. The Deep Spring Temple, located in an isolated area north of Pittsburgh, is a Soto Zen Buddhist Temple. Founded in 1999, Deep Spring Temple offers both daily meditation and personal, individualized training with the Head Priest. They hold monthly retreats in addition to their usual services, which include special services for beginners every Sunday morning. The temple also has residency training for people considering ordination. The community of the Center began in 1988, when Venerable Losang Samten, a monk at the monastery of the Dalai Lama, visited the United States with other members of the same monastery. Losang went to Philadelphia on his own, however, where he was asked by students to return to teach in the area. After receiving permission from the Dalai Lama, Losang returned in 1989 and began teaching in Philadelphia with the help of a translator. 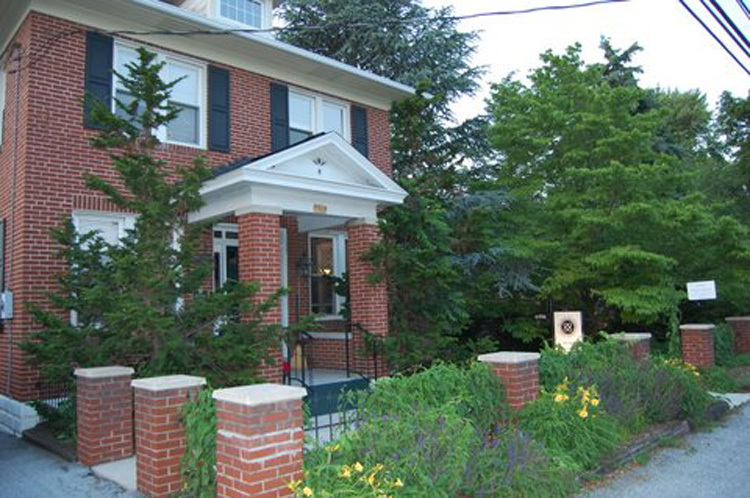 The Tibetan Buddhist Center was formally born when they were able to purchase a space in 1990. Since then, they have had to relocate to several different locations before coming to their current home in the middle of the last decade. Their name comes from the Tibetan name of the Bodhisattva of Compassion, who made it his mission to alleviate the suffering of every living being. 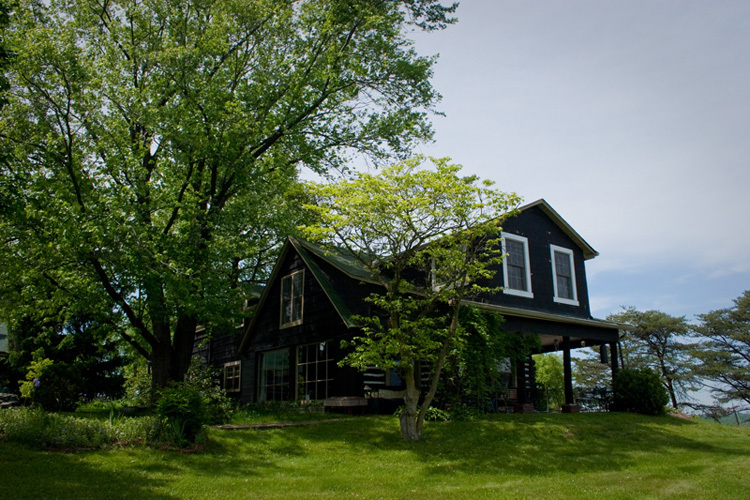 Soji Zen Center was begun by Jules Shuzen Harris Sensei, the Center's Vice Abbot and student of its Abbot, Pat Enkyo O'Hara Roshi. Like many other Buddhist centers in Pennsylvania, it was begun recently, and is not in a building that was built as a Buddhist temple. Rather, it is in a store front. 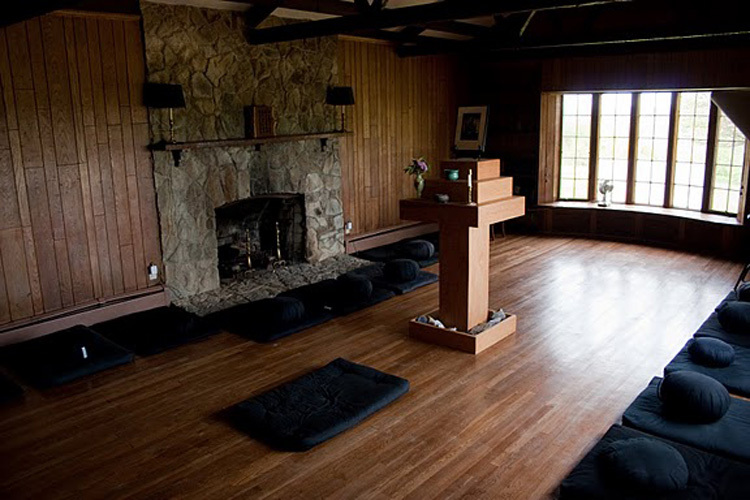 Soji Zen Center holds yearly retreats and and regular workshops, as well as offering weekly yoga sessions and meditation sessions. Additionally, workshops are offered throughout the year for beginners who wish to learn more about Zen Buddhism. 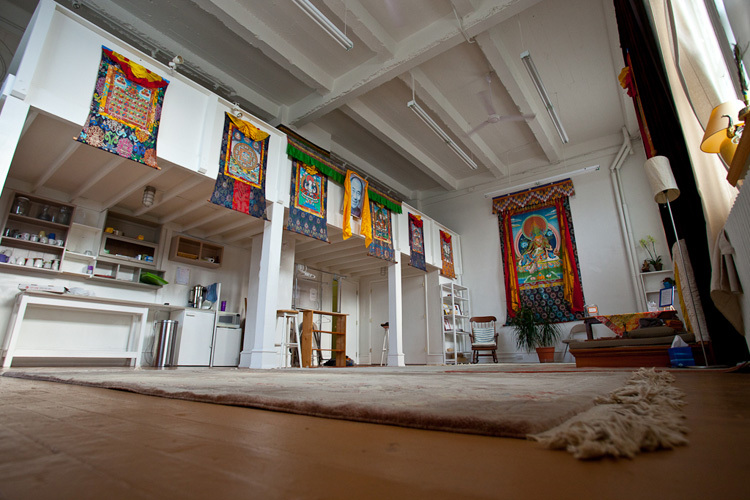 Main teaching center of Chenrezig Tibetan Buddhist Center. 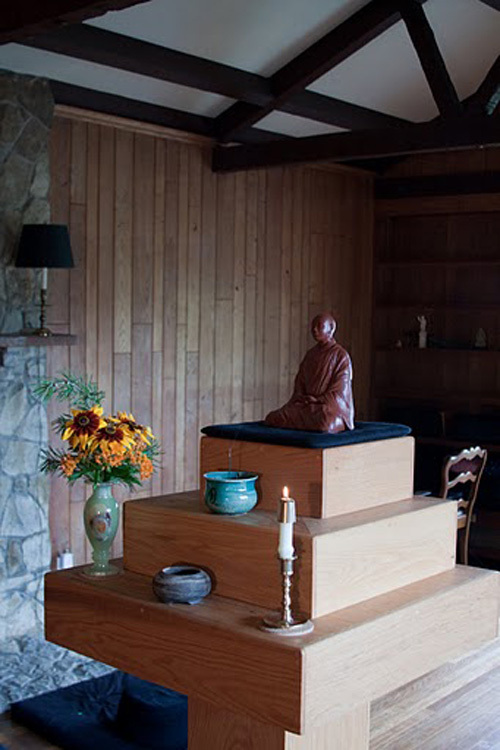 Zen Center of Pittsburgh: Deep Spring Temple, Soto Zen Buddhism. 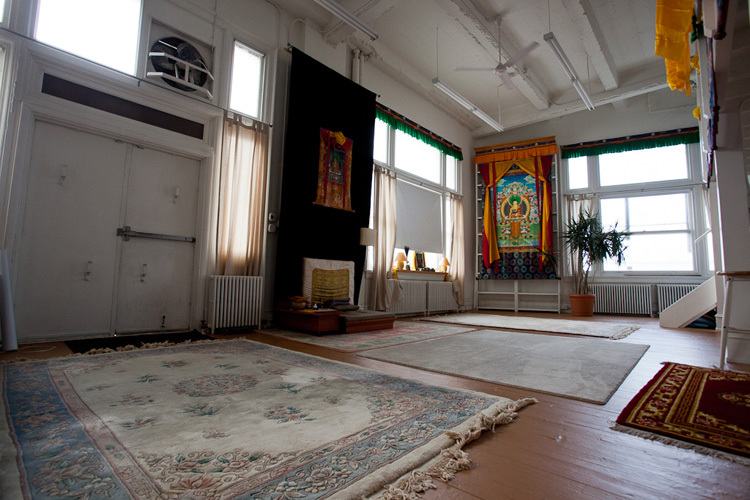 The main teaching center of Chenrezig Tibetan Buddhist Center in Philadelphia. 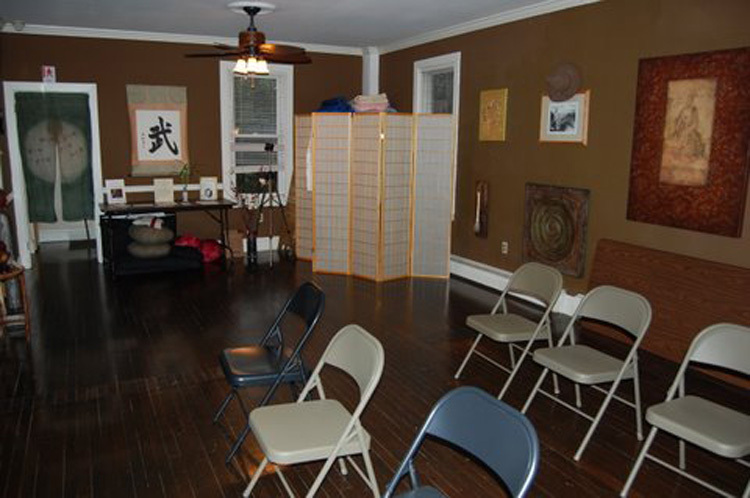 The main meditation and teaching space at Blue Mountain Lotus Society. Although chairs are pictured, cushions are also offered for students who wish to use them instead. The meditation hall of Deep Spring Temple. Practitioners of zazen sit on cushions, chairs, or benches, facing the wall for 40 minutes to more than an hour in meditation. The teacher faces the room to assist anyone who may need help during this time. 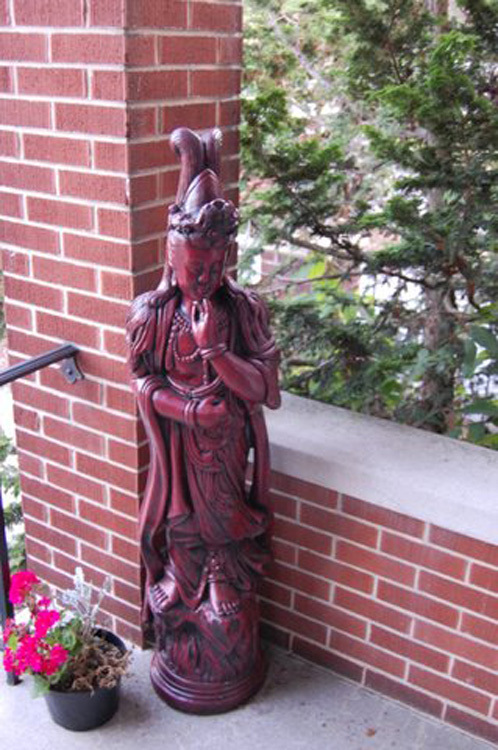 Kwan Yin, a representation of compassion and acceptance at Blue Mountain Lotus Society in Harrisburg. Manjushri, the Bodhisattva of Wisdom, in the meditation hall of Zen Center of Pittsburgh: Deep Spring Temple in Sewickley. 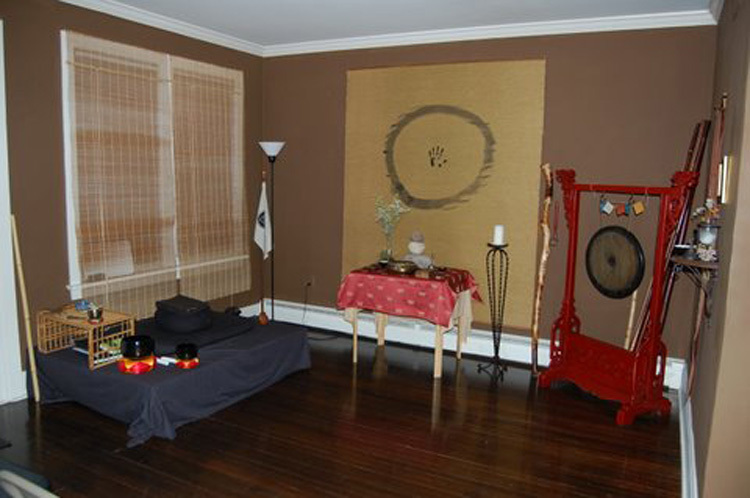 The meditation hall of the Soji Zen Center in Lansdowne.